As a bad weather geek and a one-time denizen of midwestern America, I’ve been paying close attention to the polar vortex that today is turning the nation’s heartland into a temporary imitation of Antarctica. During winter months, folks in the Midwest become accustomed to the occasional “snow day,” whereby heavy snowfalls compel the closure of schools, businesses, and some public services. But closing down for a polar vortex is quite another thing. Of course, the world of work is profoundly affected by this onslaught of sub-zero weather. With schools closing, parents’ work schedules will be thrown into disarray — assuming that their respective workplaces aren’t closing as well. Many public employees are being instructed to stay home. Even mail delivery has been suspended in areas expecting the coldest temperatures. I’m sure a lot of private businesses are shutting down today as well. And for those who have work-related air travel planned, well, this could be a frustrating day to be flying. If you are in America’s central states right now, I hope you’re reading this from a warm place. It’s a good day to attend to indoor tasks and chores, perhaps to work from home if you have a job with that kind of flexibility, or simply to get caught up on a favorite television show or movie (or two). Hurricane Harvey is proving once again that large-scale disasters bring out the best and the worst in people, and that includes those who run local businesses. Houstonian Jim McIngvale, known as “Mattress Mack,” has turned his two furniture stores into temporary shelters for Tropical Storm Harvey evacuees. As the city started to flood, he posted a video online with a simple message: Come on over. He gave out his personal phone number. And hundreds of people streamed in. One station sold gas for a whopping $20 a gallon. A hotel reportedly charged guests more than twice the normal rate. One business sold bottles of water for a staggering $99 per case — more than 10 times some of the prices seen online. As people in southeastern Texas face the devastating floodwater left by Hurricane Harvey, they are also grappling with predatory businesses that are selling basic necessities at astronomical prices. As of Wednesday morning, the state attorney general’s office had received 684 consumer complaints, a majority of which involved price-gouging of bottled water, fuel, groceries and other necessities. I’m betting that we’ll be hearing more stories of kindness, sharing, and courage during the days, weeks, and months to come. Hopefully those accounts will inspire the best in others and overcome some of the less wonderful practices that exploit people during the most trying of times. At my university we’re observing that annual academic ritual known as spring break, but Mother Nature has decided not to cooperate with the “spring” part here in Boston and along the east coast. We’re experiencing a major winter storm, and the snow is coming down heavy and wet as I write. It looks like we’ll be dealing with quite an accumulation before it’s over. I had planned to go into my office today to get some work done, but I’ve decided it will be just as easy to work on stuff at home. Today’s (and perhaps tomorrow’s) tasks are to write a foreword for a colleague’s forthcoming book and a project report. While I might have fewer distractions in the office, I like the idea of being hunkered down at home as the snow continues to fall. With no classes this week because of the break, I don’t have to worry about rescheduling snowed-out class sessions. Instead, I can once again appreciate the convenience and flexibility of being able to work from virtually any location where I can turn on my computer and access the Internet. I count myself especially fortunate to be back home today, as this appeared to be a questionable proposition during a weekend visit with friends in northern Virginia, right outside of Washington D.C. As the winter storm forecast became more dire, my prospects for flying out of Dulles airport last night started to look a tad iffy. As luck would have it, I was on one of the last flights to land at Boston’s Logan airport, per the JetBlue arrivals board below. With a bit of the white stuff falling upon us on Sunday evening, we did it: Boston broke its all-time record for snowfall! 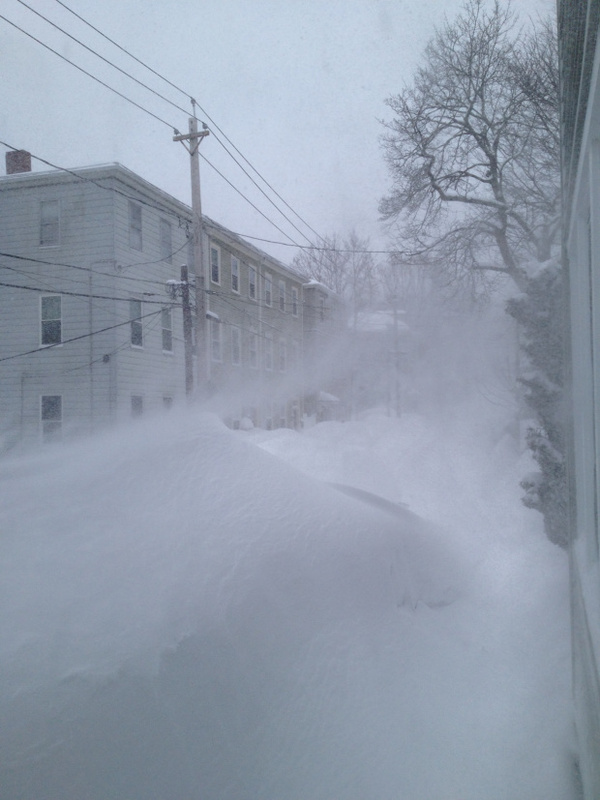 That’s 108.6 inches of snow, breaking the previous record of 107.6 inches during 1995-96. Oh boy, it’s time to celebrate, yes?! Like when the Patriots won the Super Bowl, or when the Red Sox won the World Series. Hip hip hooray! Folks, this has been a brutal winter here. And it has wreaked havoc on the world of work. The economic effect has been especially harsh on wage workers who either couldn’t get to work or found their places of employment closed down while the city dug out from the latest mega-storm. It also has been very harsh on retail businesses who depend on pedestrian foot traffic to buy goods and services. If you’re in real estate, the market, well, kinda froze. After all, it’s hard to host an open house or a showing when the roads and public transportation are shut down. Public workers involved in snow removal and public transportation had their work cut out for them. If you drove one of the city’s plow trucks during the four worst weeks of January and February, I wonder if you were ever permitted to leave your vehicle. Boston’s public transit system took some well-deserved criticisms, but the rank-and-file workers who helped to get things moving again deserved much praise. There were multiple days when just about everything was shut down. How many thousands of meetings, appointments, and just about every other type of face-to-face event were cancelled during this time? God have mercy on anyone who worked in customer service at Logan Airport. If you own a plow truck and a snowblower, you may have made a mint doing freelance jobs, like the guys who picked up a quick wad of cash from me when I realized that I could shovel for 12 hours and barely make a dent. Same thing if you did snow and ice removal from roofs. However, my guess is that you had your fill of that work even with the extra cash. Maybe it’s the Cancerian in me talking, but I believe that someday, we’ll look back at this winter with a sort of fond nostalgia. Or maybe I’m just being delusional. Whatever, we’ll see. In any event, the world of work already has been profoundly affected by Nemo, even though the current snowfall here in Boston amounts to heavy flurries. (Not to worry, it will get much worse; there’s virtually no chance that this is a false alarm.) Even last night, the streets of downtown Boston were oddly empty, as if folks were trying to get a 24-hour head start on the storm. This morning, the city is in shutdown mode, with schools, universities, and public offices closed for the day and into the weekend, and many businesses doing the same as well. Most of our public transportation system will be off the rails and road by mid-afternoon. For many of us whose work involves pen, paper, and keyboard, Nemo means work-at-home days, so long as the power stays on. Nevertheless, there is a distracting buzz about this storm, not unlike the mega-hours of excited, televised chatter preceding the Super Bowl. Given that I have a lot of stuff to do, I’ll try to use this time productively and not get overly caught up in the hype. 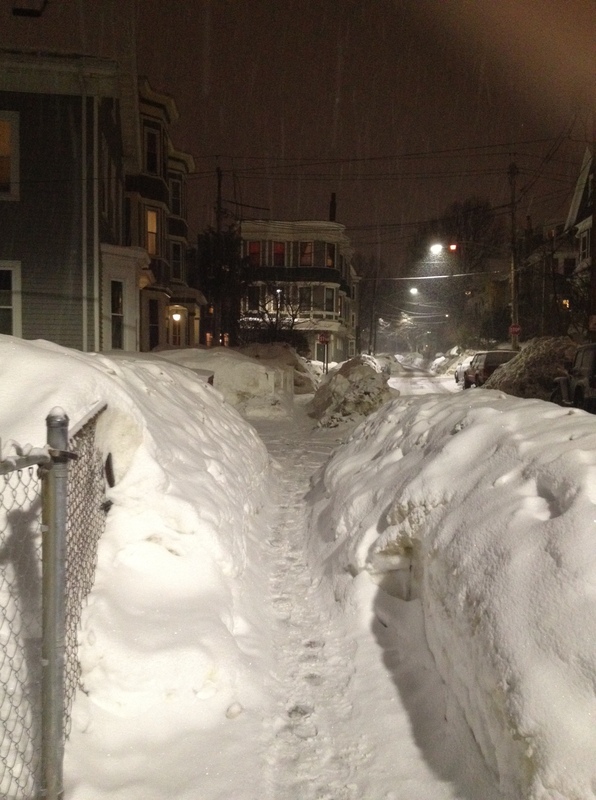 For public safety and utility workers, Nemo will be prime time. Fair or not, we tend to judge their performance during these events; on other occasions, we typically take them for granted. Unfortunately, a good number of people are going to lose a day or two of hourly wages, for “snow day” means “no pay.” The same goes for businesses that count on walk-in customer traffic everyday. A restaurant that closes for a couple of days due to weather isn’t going to make up lost sales. Of course, if you’re an airline customer service rep right now, you might wish that you, too, were told not to show up for work. Never a cushy job during normal times, it would easily make my top ten list of “most stressful jobs during inclement weather” list. 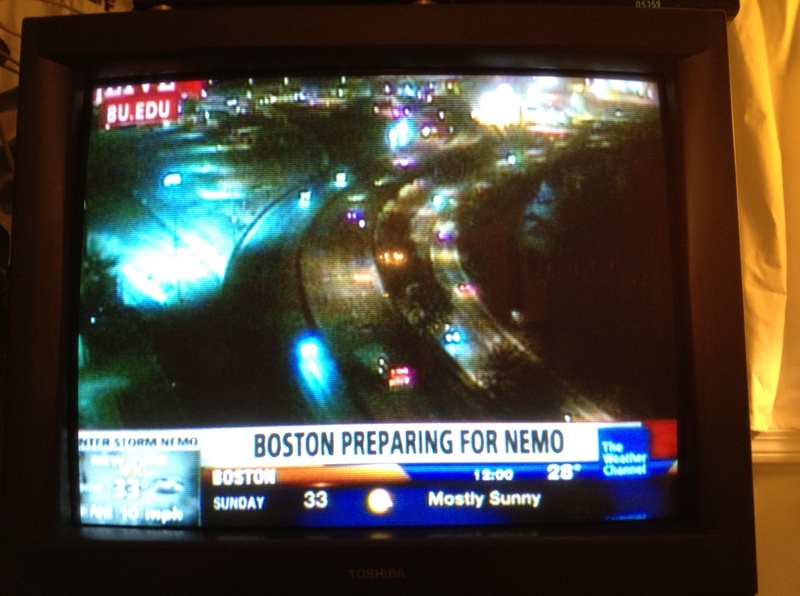 If you’re in Nemo’s path, please keep safe and warm! Laura Dunavent’s voice still quavers when she recalls the darkest chapter of her life. It wasn’t until after Dunavent, a registered ER nurse, quit her job as a case manager for an Orlando insurance carrier — “so I wouldn’t go out of my mind” — that she discovered a name for the emotional torture she says she experienced at work. …bullying is still in the embryonic stages as a political issue. The [Workplace Bullying Institute] is chief advocate for the legislation drafted by David Yamada, a professor specializing in labor and employment law at Suffolk University Law School in Boston. 2. Hurricane Sandy’s other unanticipated power — Obviously, the destruction wrought by Hurricane Sandy has been the story of the week, and it will continue to dominate the news for some time, especially in the most affected states. In addition, during the past day, we’ve seen heavy coverage of President Obama’s visit to storm-ravaged New Jersey, accompanied closely by New Jersey Governor and outspoken Obama critic Chris Christie. The two have put aside their political differences to address the task at hand, and it was clear that a physically and emotionally exhausted Christie was genuinely appreciative of the President’s efforts to help his state. As this distasteful campaign season comes to a merciful end, it’s sad that it took a disaster of such proportions to get our leaders to drop the attacking rhetoric and embrace a true spirit of can-do non-partisanship. However, maybe the images and attitudes will serve as a lesson that endures beyond Hurricane Sandy and Election Day.